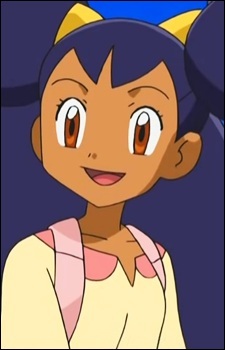 Iris is the female protagonist in Pokemon Best Wishes. Her main Pokémon is Axew, a Dragon-type. She also has an Excadrill that has been with her since it was a Drilbur, and an Emolga. She is a citizen of the Dragon Village who has been tasked by the village's elder to go on a journey with her Axew to raise it to become a great Haxorus. After meeting up with Ash, she decides to join him on his journey. In Pokémon White for the Nintendo DS, Iris is the 8th Gym Leader of the Unova Region. Her mentor is an old man named Drayden, specialized in Dragon-type Pokémon. He is the 8th Gym Leader in Pokémon Black. Two years later, in Pokémon Black and White 2, she becomes the Champion.